The federal Environment Minister, Tony Burke MP, has released the government response to the independent review of the Environment Protection and Biodiversity Conservation Act 1999 (EPBC Act)as part of a broad package of reforms for Australia 's national environment law. A draft biodiversity policy and draft environmental offsetting policy have also been released for consultation. The public comment period closes Friday 21 October 2011. 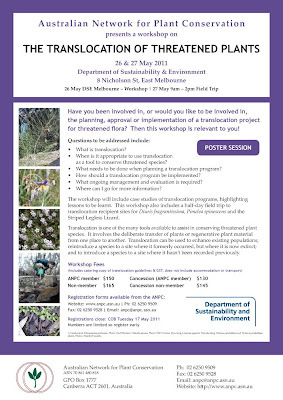 Further information is available at www.environment.nsw.gov.au/vegetation . 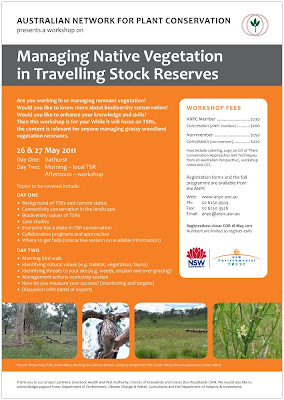 Stakeholders can register to participate by email to native.vegetation@environment.nsw.gov.au. 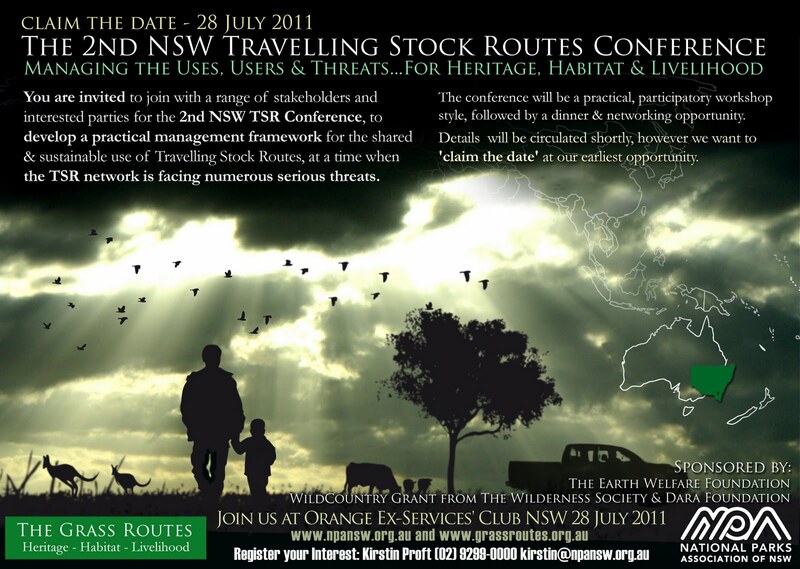 (Reproduced from Environmental Defender's Office New South Wales (Ltd) Weekly Bulletin – to subscribe click here. Applications are invited for the position of Project Manager for the ANPC. This part time position is one of two located in the ANPC National Office situated in the Australian National Botanic Gardens, Acton, ACT. The position is available for one year. Hours offered are 22.5 hours a week over three or four days. Employment will be under the Social, Community, Home Care and Disability Services Industry Award 2010 at the Social and Community Services Employee Level 8. 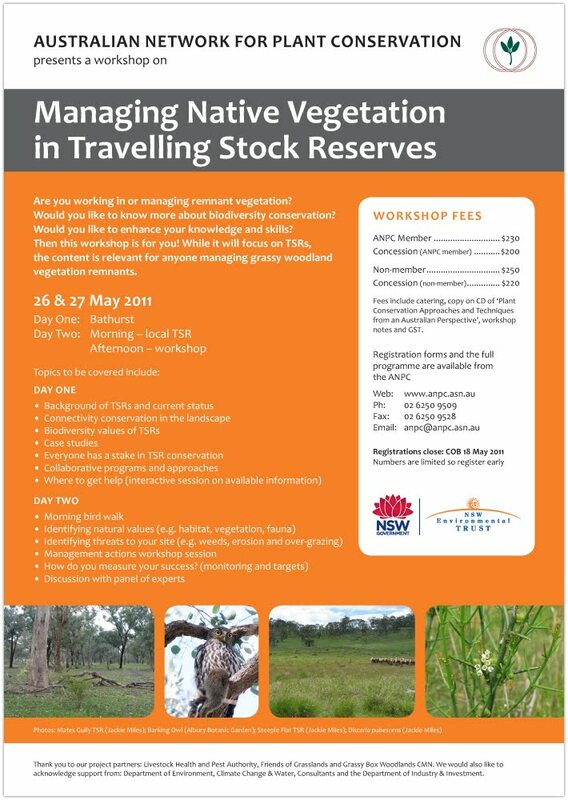 •Undertake the coordination of major projects of the ANPC, in particular developing and delivering four remaining workshops, to be held in regional centres of NSW, in an externally funded series on the Conservation of Remnant Vegetation on Travelling Stock Reserves and other linear remnants. •Assist the Committee in fulfilling the Network’s other objectives. 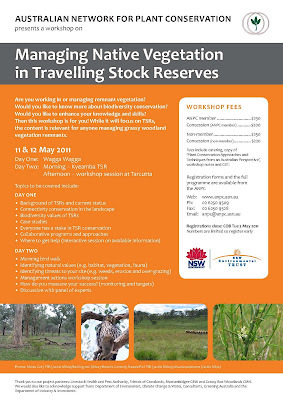 •Coordinate the organisation, promotion, implementation and evaluation of regional training workshops for plant conservation practitioners and land managers, including program design and presenter selection, identification of supporting resources, and development of some information materials. •Identify stakeholders and interest groups to support and/or attend the training events and liaise with the appropriate bodies to raise awareness and promote participation. •Assist the ANPC National Committee and relevant partners with the organisation, promotion and delivery of the Network’s conference in the second half of 2012. •Coordinate or assist with the editing, production, promotion and distribution of educational and promotional material, and other resources (including web-based). •Work closely with the ANPC Business Manager and the ANPC National Committee to assist with seeking funding through grants and sponsorship, office management and reporting. 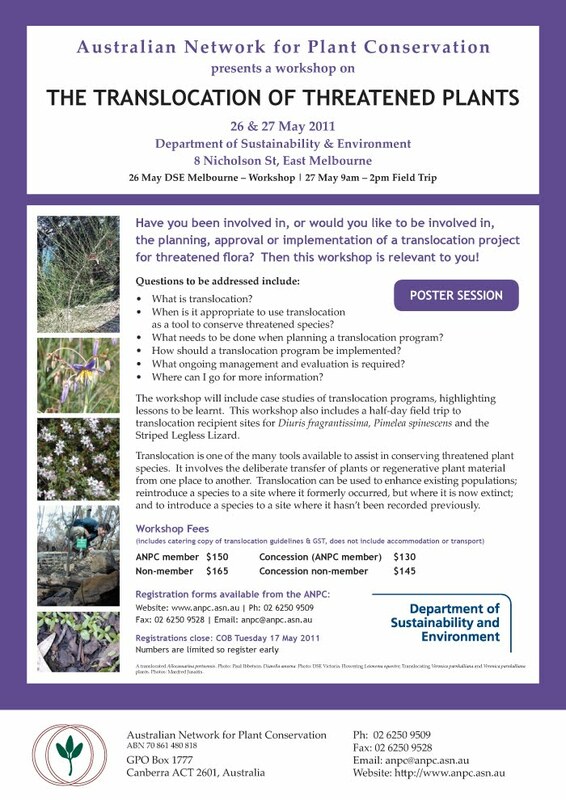 Expressions of interest – Speed Session Slots.This conference and workshop aims to address both new research findings AND their current and potential applications. 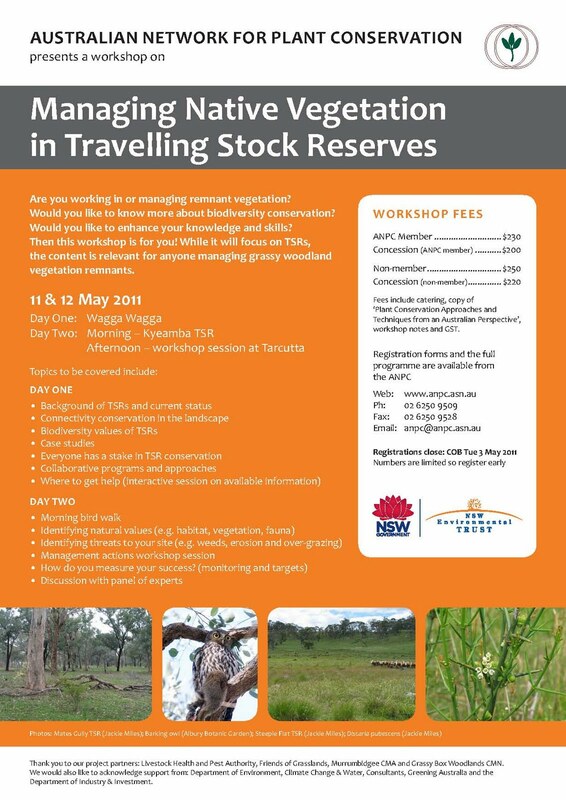 It will present field observations and research findings from scientists and mangers following recent major wetting episodes to identify opportunities for better management of discretionary environmental water. It will look particularly at the impact of drought, recovery and response observations and water and land management lessons learnt. Expressions of interest are invited to fill speed session slots. 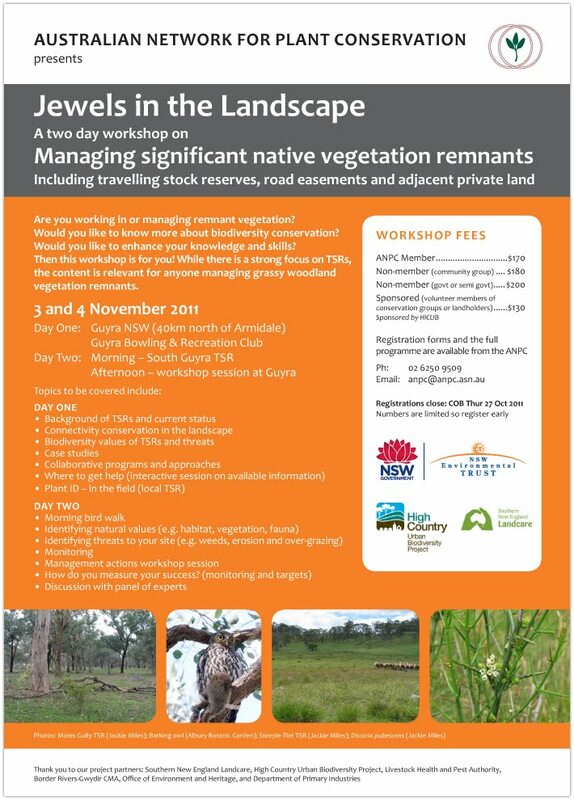 Please submit a brief (100 word) expression of interest for a 5 min presentation based on research or management case-studies to rivers.wetlands@environment.nsw.gov.au by 5th October 2011.
perennial groundcover. Small rural cemeteries contain a range of plant species no longer common in the landscape due to the activities of grazing, cropping and urbanization. The historical tenure of these cemeteries offers a haven for interesting and rare grasses, forbs and shrubs. Calling all nature champions, guardians and defenders! Do you know an inspiring person or group whose contributions over the last year have made a lasting difference to nature conservation in NSW? Don’t waste any time, make sure you nominate before 17th October! *The Dunphy Award, for most outstanding environmental effort of an individual. *The Marie Byles Award, for most outstanding new environmental campaign. *The NCC Member Group Award, for most outstanding Member Group demonstrating commitment and success in conservation. *The Climate Award, for most inspiring climate action initiative by a community group. *The Rising Star Award, for the most outstanding new campaigner under the age of 30. *The Allen Strom Hall of Fame, for long standing service and commitment to the conservation movement, and the courage to challenge Government and non-government decision-makers. *The Ziggy Megne Volunteer for the Environment Award - awarded in honour of the untiring contribution of Zigurds (Ziggy) Megne for someone who has championed a cause or worked untiringly behind the scenes for a better, more sustainable future.Nominees must have been active in NSW for an environment group or as an individual. Annual Conference. To nominate an individual or group, please visit www.nccnsw.org.au/environmentawards. Groups can nominate themselves, or their members for an award. For further info, contact Shaun Gilchrist (Ph. 9516 1488 Tue/Fri, or email sgilchrist@nccnsw.org.au ). Please mark these dates in your diary and further information will be circulated as it becomes available. Registrations close: COB Wednesday 26 October 2011. 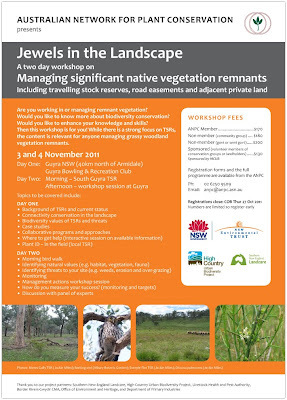 To register or for more information email the ANPC office: anpc@anpc.asn.au or phone: 02 62509509. Trust For Nature is opening the gate to visitors to private conservation properties in Victoria through September and October, to showcase their biodiversity and the regeneration work being done. Many of these properties are a haven for rare or threatened native plants and wildlife; good rains also means there will be some fantastic wildflower displays this season. The iconic west Kimberley will be placed on Australia’s National Heritage List, Environment Minister Tony Burke announced on 31 August 2011. Mr Burke said the Gillard Government would recognise outstanding heritage values within more than 19 million hectares of the west Kimberley, including Aboriginal, historic, aesthetic and natural heritage values. The area to be placed on the National Heritage List includes the spectacular Kimberley coast from Cape Leveque in the west to Cambridge Gulf in the east, the Kimberley plateau and country south to the Oscar and Napier Ranges, and the mighty Fitzroy River. The National Heritage Listing will provide the west Kimberley with Australia’s highest form of heritage recognition. “The west Kimberley belongs on a list of the places which define Australia,” Mr Burke said. For more information on the listing including a map of the west Kimberley National Heritage Place click here.